I read the book Getting things done and I found some interesting suggestions. The main problem of the book is that it mainly considers paper based documents. First of all I suggest reading the book, I’ve already reviewed it here. Here you can find it summarized with some suggestion in order dial with GTD using Trello or Asana if you prefer. I’ve already written about Trello vs Asana, so before starting this metodology I suggest reading the post and trying them if you don’t know both. I usually work on many projects so my main target is to deal with them in order to getting things done without losing some steps. I started using this method in my private life as well. First of all in this board I write down all activities I’ve got to do and all activities I’m waiting for someone. 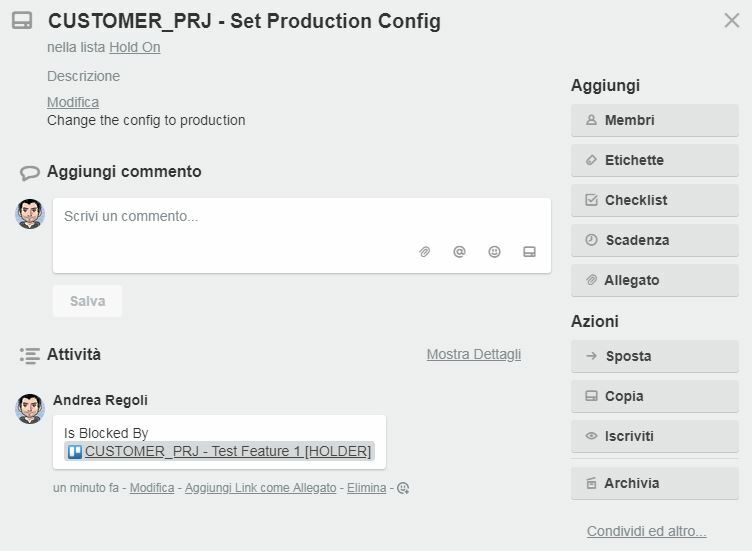 All my activities are single (not subtask) while someone elses’s activities are grouped using checklist: I’m interest in remembering that someone is working on thet project and I will probably check it but I’m not interested in all user stories processed because they are probably tracked in jira. “[SOMEONE’S NAME]” usually in “Waiting for” or “In progress (Internal)” columns to remember who I’m waiting for or who is doing the task. It’s a sort of assigned to. Every time I move a holder card to done I check the comments to find out the blocked card and dial with it moving it to the right column. Do you find an interesting article but you don’t have enough time to read it? send it to trello’s inbox list in order to decide what to do when you process the card. Zapier supports both gmail (personal use) and Office 365 (outlook calendar). As you can see, with zapier you can use the same application as source and destination. Remember that you can even use both IFTTT and zapier. An interesting automation is that when you add an appointment to your calendar a card i automatically created to scheduled column. In addition I automated the creation of a complex and full detailed card everytime a google form is submitted (pe). I also found Butler powe-up for Trello, but I don’t use it. There are many ways to send your emails to trello inbox list. You can do it with zapier and IFTTT, there are actions that creates a card every received email or only starred email. These solutions work very well if you want to automate all the process. It supports also email with attachment, attaching them to the card. The main problem of this, is that Trello supports markdown and not HTML so you see only text in the card. There is a Chrome extension for Gmail but I don’t like Gmail-to-Trello give it a try if you want. It would be great if Trello and Asana implemented a security trimming for user: view only allowed card without seeing all cards in board. If this feature was available I would open my board to all my stakeholders so they can check if I’m waiting something from them or what are we doing. 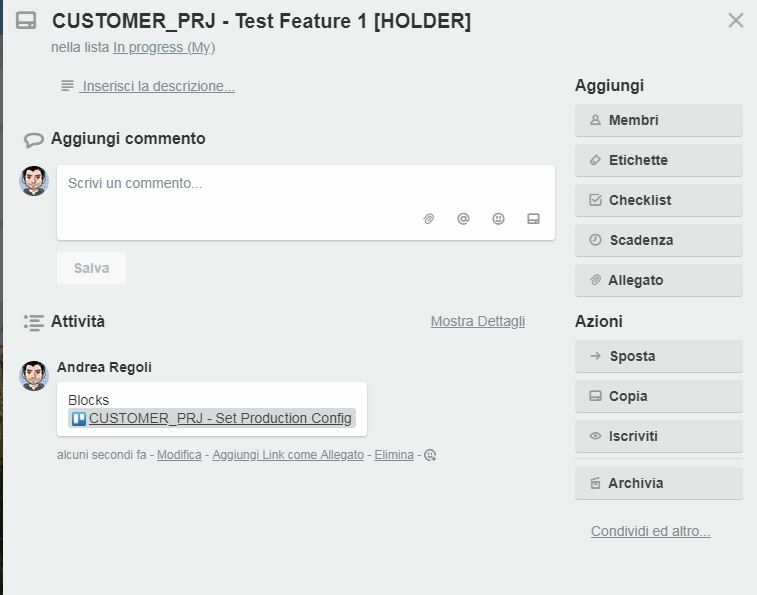 Questa voce è stata pubblicata in Management e contrassegnata con evernote, Getting Things Done, GTD, IFTTT, Productivity, trello, zapier. Contrassegna il permalink.